I was wondering i any of you had experience with both the valkyrie and the 1500 Goldwing. I've fallen in love with Goldwing feel, when i ride my 1100, but for many years i've loved the look of the old F6C, and since i've learned that it comes in a interstate version, i've been wondering about it. It is not a common bike here in denmark. Are the two bikes simular, or are they very different. My biggest fear about the valkyrie, is that it lags maneuvrebillyti, not the the 1100 is super agile, but a U-turn in a 2 way street is easily done, and roundabouts kan be great fun. 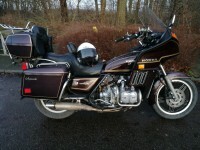 I had a 1981 GL1100 interstate - loved it. I have a 2000 Valkyrie F6C - weights 307kg but not an interstate - the Valkyrie is an awesome power cruiser. Not awkward and very agile even at low speeds. I have done several thousand kilometres on the Valkyrie so far - it is a very enjoyable ride - if you had a riders backrest -then you could ride it a long way without feeling uncomfortable. I find about 2 hours in the saddle is enough before I need a break. The first three all at the same time and later by a few years, the last three all at the same time. I liked them all. Each one is different and great in their own way. The Goldwing is certainly nice with audio system, cruise, reverse, linked brakes, canceling turn signals, etc. The Valkyrie will ALWAYS draw a crowd. And of course, with the variety of colors, you certainly will stand out from the V-twin crowd. Most Valkyries have a bit louder exhaust than the Goldwing. With six carbs and different camshafts, they will not get the same gas mileage. The Goldwing is slightly heavier but has a lower center of gravity. You might notice the higher horsepower and torque with the F6C depending on your riding style. Handling was very natural and I had no issues switching back and forth between them. great answers, thank you very much. The comfort on the valkyrie was actually one of my conserns, since we use our bikes to go on vacations, and im the one who carries most of our luggade. About the more noisier exhaust on the valkyrie, i like the muffeled rumble of the GL1500, i don't like to ride noisy bikes, i only enjoy them when others go by on them. My riding style is probably mostly comparaple with the old man in a strawhat But a bit playish in the bends. If or when I go ahead and change my 1100 to a F6C Interstate I will most likely have to find one in Germany and import it. do it drive like the standard, or is it different? The F6B isn't always louder than the Goldwing. It's that most have had some previous owner perform modifications. If completely stock exhaust, I personally would at least change the tailpipes to extend them back past the rear fender/panniers just to minimize any drone. If you find a bike you love except it has an unacceptable exhaust, buy it anyway and build a new system using glasspak mufflers. Instructions are in the tech section of the link I provided above. The Interstate obviously provides more wind protection but otherwise they both handle very well. I like an operator backrest, especially if you don't have a fairing. Fair amount of air pressure on your chest and arms otherwise. You will notice the torque increase over your 1100 right away. Watch your speed! Okay thanks again for a solid answer, I will check out the links.